I will gladly do my best to rectify the situation for you. We are located in Fabulous Las Vegas. We will always do our best to rectify any issue to keep you happy! We price all products at or below fair prices. This is a rare New in Package Digital Storage Keychain. The Package has some stains on it, but this is a neat collectible. Holds up to 100 Digital Pictures. "Show off your favorite photos to family and friends." It has a 1.5" screen for viewing. Thank you for your interest in this Item. Everything comes from a smoke and pet free environment. Shipping is always every week day and almost always on Saturdays. There is a 60 day money-back guarantee on all listings. Please message any questions, as they will be answered in a timely manner. Thanks for your time and confidence. You are Buying a Digital Photo Keychain 1.5" LCD Screen 54 Pictures NEW. It is in New Condition. See pictures for item condition. NIB shift 3 digital photo album with keychain. It has a 60 photo capacity. It has a new extra slim design. Pc and Mac compatible. Super slim compact design. It is purple and holds 60-100 pictures. Sharper Image Digital Photo Keychain Purple New !!! USB 2.0 Digital Photo Keychain. Sharper Image. Large 1.5" Color LCD Display. THE SHARPER IMAGE Digital Photo Keychain USB 2.0 Rechargeable 1.5" Screen Purple Condition is Used. Shipped with USPS First Class Package. Large 1.5” color LCD display. USB 2.0 (cable included) for PC/MAC. 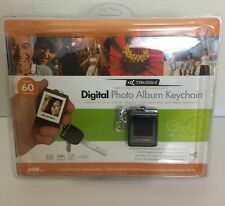 DIGITAL PICTURE VIEWER WITH KEY CHAIN BY SMART PARTS HOLDS UP TO 100 DIGITAL PICTURES NIB . ~INCLUDES USB CABLE FOR EASY PHOTO TRANSFER AND RECHARGING. ~PLUG AND PLAY-WORKS WITH WINDOWS 2000/XP/VISTA. New in box the shape image digital photo keychain USB 2.0. SMALL AND LIGHTWEIGHT ENOUGH TO KEEP IN YOUR POCKET. SHOW OFF TO FRIENDS AND RELATIVES! Disney Hannah Montana. 10 Hannah photos included. Digital Photo Cube. Displays up to 70 photos. New in Box. MERKURY INNOVATIONS 1.5" PURPLE LCD DIGITAL PHOTO VIEWER KEYCHAIN MI-DF0159 NEW!